Here's Lucy sitting on the kitchen rugs. Every time I pull them up, shake them off and throw them in the other room so I can sweep up the kitchen, she goes right to them. Well, first, she comes in the kitchen to try and walk through the mess I'm trying to sweep up. So after I chase her out of the kitchen, she goes right to the rugs. 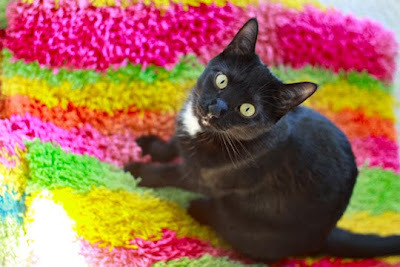 And they make the perfect colorful backdrop for a little black kitty.